Growing deer-resistant plants is a necessity for many gardeners now that deer have become a major problem in many regions. The deer population is increasing, and sadly, we’re partly to blame: we keep building homes in their habitat, and the loss of wild areas means fewer natural predators. 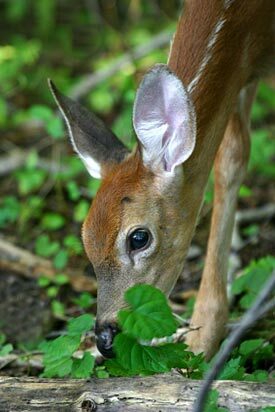 Deer are attractive creatures, but gardeners would be happier if they weren’t so keen to devour favorite perennials and shrubs. Deer are most active just after dark and before dawn, when you’re not going to be around to scare them off. Deer fencing: This is the most effective deer-resistant option, but also the most expensive or work-intensive option. Deer fences should be at least six to eight feet high. Sloping your fence at an angle, near the top, so the top of the fence points away from your garden increases its effectiveness. Polypropylene mesh fencing is the most cost-effective option, and not difficult to install if you are a do-it-yourselfer. This type of fence is not an eye-sore, as it blends into the landscape quite unobtrusively. Netting: If you have just a few plants to protect, you can wrap plastic netting around them or put it on the ground around the plant — deer hate stepping on netting. Repellents: There a number of effective products that you can spray on plants to make them taste or smell bad. Many gardeners swear by Plantskydd® deer repellent for preventing both deer and rabbit damage. Another recommended product is Liquid Fence, a non-toxic egg-and-garlic formulation is easy to apply and lasts four weeks. Human or dog hair: Some folks put human hair from salons around the garden so deer can readily catch the scent. Dog hair from a dog-grooming establishment can also do the trick. Predator urine: This stuff, courtesy of wolves and coyotes, can make deer nervous enough to steer clear of your place. Available from garden suppliers and online. Ultrasonic devices: These repellent devices are expensive, and deer can become accustomed to familiar sounds and objects, which means that this most successful if you move the ultrasonic transmitter frequently. Radio sounds: If you use a radio, it doesn’t have to be very loud. Your best bet is to tune to an all-night talk station, as human voices are scarier for deer than music. Obviously, this is not an option if it’s loud enough to disturb your neighbors’ sleep, not to mention your own. Deer will eat almost anything if they’re ravenous enough, but they usually don’t bother the plants listed below. Normally, they avoid plants with a strong taste or smell to their leaves, and they don’t relish hairy leaves.